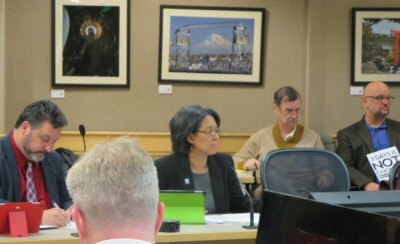 December 9, 2014 paid sick leave took a step closer to reality in a committee of the whole meeting of the Tacoma City Council, where Mayor Marilyn Strickland floated her proposal. The public was permitted to view the proceedings, but not comment on them. Each Council member had a unique point of view, but debate was civil, if contentious on a few occasions. The Mayor framed the initial discussion by introducing answers to frequently asked questions (FAQs) and was roundly complimented by Council members for introducing a concrete proposal that could finally move the issue forward. In a nutshell, the proposal requires all businesses, small and large, to offer earned paid leave for illness of the employee or family member, to deal with domestic abuse and to attend medical appointments. The ordinance would go into effect one year after passage by the Council, giving time for training businesses in the law and time for the City to staff and budget for the administration of the ordinance. The Mayor read out the FAQs and their answers to get the discussion going. The proposed leave would be awarded and taken on an hourly basis. Forty hours of work at a business earns one hour of leave at that business. The maximum leave that can be taken in a year is 24 hours – full days or in hourly blocks, e.g., two hours to go to a medical appointment. Leave earned does not roll over to the next year, i.e., it is not cumulative. Enforcement is complaint based; employers will receive education on the various aspects of the ordinance to help them comply. Three days is the average number of days used in a study of experience in San Francisco. There are no tiers in the proposal, i.e., every size business has the same requirements regardless of its number of employees. The Mayor stressed that the required earned leave limits are minimums. Nothing in the proposal prevents a business from offering more leave. Employees are permitted to voluntarily trade shifts. David Boe urged that a careful study be done, so that it would be clear whether 3 days or 6 days is the right number and to determine how many businesses the ordinance would affect, the cost to the city, including the ramp up with training, and staff needed for enforcement. He said the viability of the program depends on market share. When a market is larger as in Seattle, businesses can absorb the cost better. Tacoma businesses will have a hard time, especially small businesses. This really should be a state issue. He said he will offer an amendment to that effect. Lauren Walker calculated that based on one hour earned for 40 worked it is mathematically possible for a full-time employee to earn more than 24 hours, but the extra hours cannot be taken. She expressed concern that three days can be difficult for a business with 2 to 3 employees. But in her experience, when the numbers are laid out carefully, even such a business can see a way to make it work. She felt that we need to value employees as well as businesses. In her opinion it is unlikely the state will enact a paid sick leave law in the near future; so, we in Tacoma have to do it. At a meeting of the Association of Washington Cities a Seattle Council member shared with her that 3 days was better than no days and that it is important to pass something now. She agreed that it is important to include cost of reporting in the budget. Joe Lonerghan noted that there are costs to a business of record keeping associated with such an ordinance, as well as costs to the city to administer the ordinance. Ryan Mello argued that it is important to realize that choosing three days is setting a standard and that three days is just not enough; while three days sick leave used might be the average number of days per worker, the individual’s life doesn’t run on averages. He praised Tacoma's small businesses, but castigated Tacoma's Fortune 50 and 100 companies that don’t offer paid sick leave. He said that the idea of keeping the ordinance simple is a good one, but he will offer an amendment for seven days with a two tier system. He also pointed out that if the sick days automatically reset to zero on each anniversary necessitating the employee to start over earning hours, there will be a period of little or no sick leave earned, perhaps occurring during high flu season in January and February. He maintained this must be fixed. Regarding gathering data, he said we can extrapolate from studies of experiences of other cities, when we are looking to find comparables; we don’t have to create new data; then later we can do follow-up studies, as other cities have done, and make adjustments based on what we find. Victoria Woodard remarked that from day one her goal was to get more members of the Council under the tent and was pleased that there now was something on the table. She said she didn’t know what the right number of days is, but there is no doubt that we need to provide something to those who can’t take off from work because they can’t afford to lose pay. Anders Ibsen seconded the remarks by Council member Mello and added that it is a myth that a business can only be profitable if it cuts labor costs. Marty Campbell commented that he experienced anger from a small business that already voluntarily offered paid sick leave and felt an ordinance requiring all businesses to pay sick leave would erase its competitive advantage in hiring workers. It might not seem like much, but business is concerned about the paperwork. We need to keep it simple. He also asked what happens in the scenario where a business is located outside the city but makes deliveries into the city. The Mayor responded to many of the points made by Council members. There is no doubt that this ordinance will have an impact on business. Small businesses are concerned, because they are the most at risk. We need to consider both sides of the issue of paid leave. It is important to not pit employers against employees. The problem with tiers is that even within a tier each business is different . So, tiers are a slippery slope and more difficult to administer. One big plus of the proposal is that it is based on hours worked. So, part-time workers are also covered. The proposal provides paid leave for the threat of domestic violence, stalking and bereavement. We don’t really need to appoint a task force to study whether Tacoma needs a paid earned sick leave policy. It is already clear that there are many employees working without paid leave. The existing business licensing process would be extended to cover the leave ordinance. After the airing of facts and opinions, the Mayor asked for consensus on whether the Council was ready to move her proposal forward and put it on the agenda for future meetings. Council member Walker supported moving forward sooner rather than later, because interest in the proposal has momentum. Council member Boe worried that the Council was rushing. In the end the Council agreed to have the first reading of the Mayor’s proposal on December 16 at the regular Council meeting and have the second reading together with Council action in January . Here is a copy of the Mayor's draft ordinance. Here is a handout provided at the meeting.